[Satnews] After a year-long wait in storage for a Proton rocket to become available, the EDRS-A laser communications payload and its Eutelsat host satellite are finally at the Baikonur cosmodrome and being prepared for launch in late January. EDRS-A is packed into its flight case atop the Eutelsat-9B satellite in Toulouse, France, preparing for flight to Baikonur, Kazakhstan, for launch. Photo credit: Airbus Defence and Space. The Eutelsat-9B/EDRS-A satellite has undergone a plethora of tests to make sure it is space-ready after its journey. EDRS-A's laser terminal is essentially an autonomous state-of-the-art telescope, with mirrors to help the laser lock on to its mark in lower orbits from its own position in geostationary orbit. The moving target can be up to 45 000 km away and requires an astonishing level of precision to hit. Extreme precision requires absolute cleanliness before EDRS-A reaches orbit - any grime or speck of dust can affect the terminal's mirrors and ability to pinpoint its target. Laser beams are capable of higher accuracy and capacity than radio - up to a record-breaking 1.8 Gbit/s of user data. The terminal is also fitted with a Ka-band radio transmitter to deliver the data to a ground station. The radio downlink is an important part of EDRS's services. Like the laser element, it is a two-way link that helps EDRS customers to send commands to their satellites. 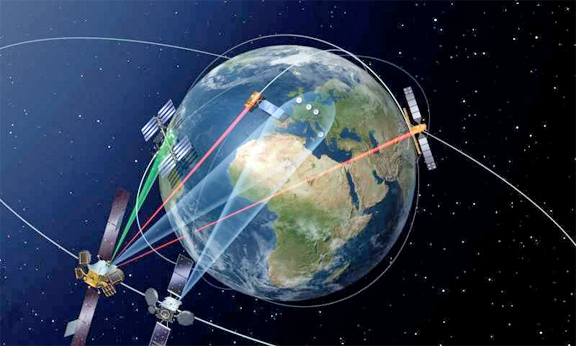 The European Data Relay System (EDRS) is designed to transmit data between LEO satellites and the EDRS payloads in geostationary orbit using laser communication technology. Imge is courtesy of the European Data Relay System (EDRS). With the majority of checks now made and the payload found to be doing well and in lock down before launch, attention turns to its host, Eutelsat-9B, a commercial telecom satellite by Eutelsat, one of the world's leading satellite operators. The EDRS-SpaceDataHighway is a public-private partnership between ESA and Airbus Defence and Space. ESA's Martin Born performed a last inspection. "The terminal is in excellent shape," he said, "and all the tests we have performed so far have demonstrated its readiness for the mission. It has been purged with dry nitrogen gas to prevent any contamination from getting into the aperture. The multi-layer insulation has been sealed for flight, and the terminal will now remain closed and locked until EDRS-A reaches orbit." Nicolas Le Gallou, EDRS-A payload engineer, said, "Checks on the payload here in Baikonur include verification of the good health of all the radio-frequency equipment. "The digital processor, modulators and receivers have all been checked to make sure they were not harmed during transit. All the results were in line with the tests done in Toulouse prior to shipment." ESA's Khalil Kably said, "So far, so good. We have passed the flight readiness review with no issues. The satellite is now at maximum helium gas pressure. The next step is to push the satellite to the fuelling stand, where a few hundred kilograms of propellant will be loaded. Meanwhile, the Russian teams are proceeding with the Proton launcher's mechanical assembly and electrical tests."